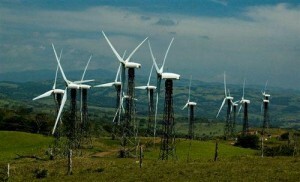 Wind farm in Costa Rica. Image source. Data from the National Center for Energy Control (CENCE) showed that Costa Rica went 257 days on almost 100% renewable energy. 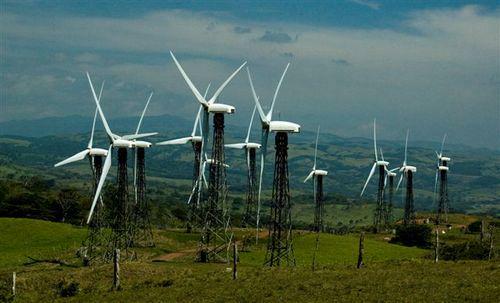 According to the Latin Correspondent, the Costa Rican Electricity Institute (ICE) reported that 98.82 percent of the electricity generated for domestic use came from renewable sources such as wind, geothermal, solar, biomass, and hydroelectric plants. Only 1.18 percent of generated electricity came from fossil fuels, used as a backup in the events of unfavorable weather conditions. “The decline in oil imports has positively impacted electricity prices, as well as the expansion strategy and exchanges with the regional electricity market,” said ICE CEO Carlos Manuel Obregon. Luis Pacheco, ICE manager, added that their projections show the trend continuing in 2016. ICE announced in March that the country’s initial target is to survive on 97.1 percent of clean energy. Costa Rica has long been a leader in using renewable sources for electricity, prior to world leaders focusing on other sources of energy as a result of climate change. Earlier this year, ICE announced that the country ran on 100 percent clean electricity for the first 75 days of the year. This was considered a huge feat by the international community, but more importantly, it was good news for consumers as electricity prices were cut by 7 to 15 percent. The feat can be attributed to rainfall that Costa Rica received in the first part of the year, as the country mostly relies on the hydropower generation. Costa Rica is committed to be carbon-neutral come 2021.